Is Iran Capable of Building Nuclear Weapons? The United States has assessed that Tehran possesses the technological and industrial capacity to produce nuclear weapons. But Iran has not yet mastered all of the necessary technologies for building such weapons. Whether Iran has a viable design for a nuclear weapon is unclear. 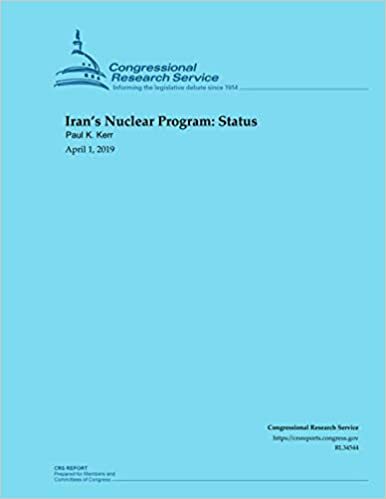 A National Intelligence Estimate made public in 2007 assessed that Tehran “halted its nuclear weapons program” in 2003. The estimate, however, also assessed that Tehran is “keeping open the option to develop nuclear weapons” and that any decision to end a nuclear weapons program is “inherently reversible.” U.S. intelligence officials have reaffirmed this judgment on several occasions. Obtaining fissile material is widely regarded as the most difficult task in building nuclear weapons. As of January 2014, Iran had produced an amount of LEU containing up to 5% uranium-235, which, if further enriched, could theoretically have produced enough HEU for as many as eight nuclear weapons. Iran had also produced LEU containing nearly 20% uranium-235; the total amount of this LEU, if it had been in the form of uranium hexafluoride and further enriched, would have been sufficient for a nuclear weapon..
After the Joint Plan of Action, which Tehran concluded with China, France, Germany, Russia, the United Kingdom, and the United States (collectively known as the “P5+1”), went into effect in January 2014, Iran either converted much of its LEU containing nearly 20% uranium-235 for use as fuel in a research reactor located in Tehran, or prepared it for that purpose. Iran has diluted the rest of that stockpile so that it contained no more than 5% uranium-235. In addition, Tehran has implemented various restrictions on, and provided the IAEA with additional information about, its nuclear program pursuant to the July 2015 Joint Comprehensive Plan of Action (JCPOA), which Tehran concluded with the P5+1. Although Iran claims that its nuclear program is exclusively for peaceful purposes, the program has generated considerable concern that Tehran is pursuing a nuclear weapons program. The U.N. Security Council responded to Iran’s refusal to suspend work on its uranium enrichment program by adopting several resolutions that imposed sanctions on Tehran. Despite evidence that sanctions and other forms of pressure have slowed the program, Iran continued to enrich uranium, install additional centrifuges, and conduct research on new types of centrifuges. Tehran has also worked on a heavy-water reactor, which was a proliferation concern because its spent fuel would have contained plutonium—the other type of fissile material used in nuclear weapons. However, plutonium must be separated from spent fuel—a procedure called “reprocessing.” Iran has said that it will not engage in reprocessing. How Soon Could Iran Produce a Nuclear Weapon? Then-Under Secretary of State for Political Affairs Wendy Sherman explained during an October 2013 hearing of the Senate Committee on Foreign Relations that Iran would need as much as one year to produce a nuclear weapon if the government decided to do so. At the time, Tehran would have needed two to three months to produce enough weapons-grade HEU for a nuclear weapon. Iran’s compliance with the JCPOA has increased that time frame to one year, according to U.S. officials. These estimates apparently assume that Iran would use its declared nuclear facilities to produce fissile material for a weapon.